Archaeologists have been searching for the birthplace of the legendary King Arthur and they think to believe they may have discovered it at a Cornish palace. This palace in Tintagel is believed to have been built in the sixth century – around the time that the king may have lived. They have uncovered 3ft thick palace walls and more than 150 fragments of ancient pottery and glass which had been imported from around the world. The castle is popularly thought to be the legendary birthplace of King Arthur, in part because of the discovery of a slate engraved with ‘Artognou’ which was found at the site in 1998. Some remains of cups and have been discovered at the excavation site proves that the medieval people residing in this palace drank wine from Turkey and olive oil from the Greek Aegean. They did this while using cups from France and plates made in North Africa. When the initial geophysical surveys were conducted, it was found the walls and layers of buildings had been built between the 5th and 7th centuries. In the latest excavations led by Cornwall Archaeological Unit (CAU), it was found how and when the buildings were constructed and how they were used. Historians believe that the 3ft thick walls discovered during excavations are from a palace belonging to the rulers of the ancient southwest British kingdom of Dumnonia. It is believed by the historians that the people who lived in this palace have been of elite status. The archaeological evidence – scores of fragments of pottery and glass – show that they were enjoying wine from what is now western Turkey and olive oil from the Greek Aegean and what is now Tunisia. What’s more? they ate their food from fine bowls and plates imported from western Turkey and North Africa, while they drank their wine from the very finest, beautifully painted French-made glass cups. Over the past few weeks around 150 shards of pottery have been found – including fragments of amphorae (used to transport wines and olive oil from the Eastern Mediterranean) and fine tableware. This kingdom was centered in the area we now know as Devon, but included parts of modern Cornwall and Somerset, with its eastern boundary changing over time as the gradual westward expansion of the neighboring Anglo-Saxon kingdom of Wessex encroached on its territory. The mysterious origins of the British archaeological site most often associated with the legend of King Arthur have just become even more mysterious. The archaeologists have found that the discovery is of major historical significance whether it is related to any Arthurian connection, is yet to be confirmed. For the first time in Britain, a really substantial discovery of this importance from the 5th and 6th centuries, the Dark Ages have been found. So far the excavations have revealed massive metre-thick masonry walls, steps, and well-made slate flagstone floors. Some of the buildings were relatively large. Around a dozen have been archaeologically or geophysically located over recent months. The probable palace appears to have been the more luxurious part of a much larger complex of literally dozens of buildings which covered most of the Tintagel promontory. These other structures may well have housed artisans, soldiers and other retainers who worked for the ruler who lived there – probably the King of Dumnonia. The whole complex appears to have come into existence some time in the 5th or the early 6th century AD – but was probably in decline by the early 7th. So far, no evidence of any catastrophic destruction has been found. Scholars have long argued about whether King Arthur actually existed or whether he was, in reality, a legendary character formed through the conflation of a series of separate historical and mythological figures. 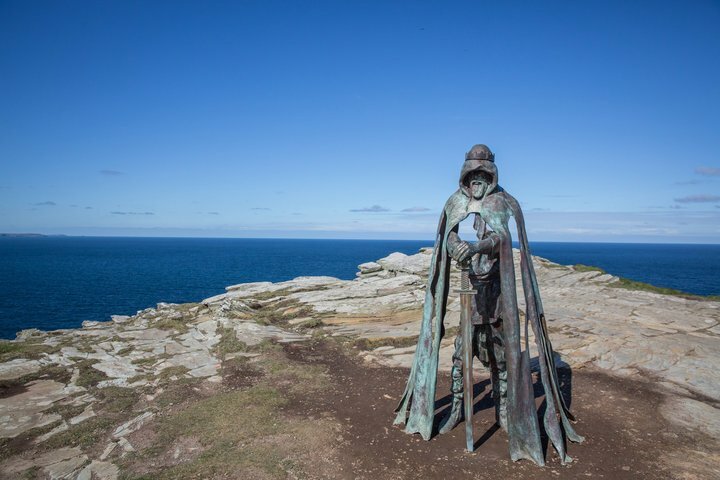 But the discovery by English Heritage-funded archaeologists of a probable Dark Age palace at Tintagel will certainly trigger a debate in Arthurian studies circles – because, in medieval tradition, Arthur was said to have been conceived at Tintagel as a result of an illicit union between a British King and the beautiful wife of a local ruler. 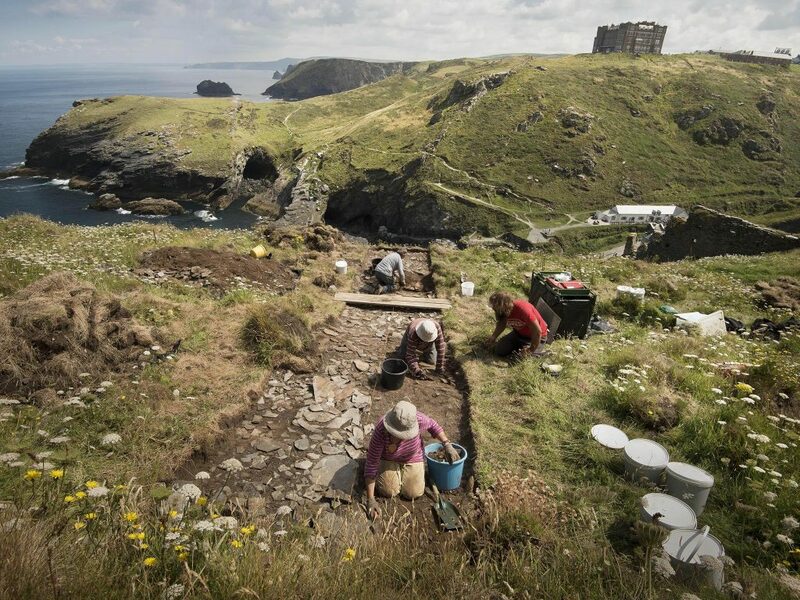 The latest discovery of the palace walls in Tintagel may or may not shed light on the Arthurian legends; it’s already helping to paint a picture of a period of history where little is known.